Feast of the Five Wounds? In the pre-1962 Passionist Calendar, tomorrow would have been the Feast of the Five Wounds. At that time, each Friday of Lent before Passiontide was dedicated to one of the instruments of the Passion (the Arma Christi), with the last Friday before Passion Sunday (tomorrow) being dedicated to the Five Wounds. The devotion to the Five Wounds was also expressed by the Passionists through promoting the Chaplet of the Five Wounds; for each of the five wounds, the person says the Glory be to the Father five times followed by a Hail Mary in honour of Our Lady of Sorrows. The chaplet is not seen very often nowadays, although I noticed recently that Jason and his friends at Duquesne are praying it. The one I have belonged to Father Ignatius Gibney C.P., who died in 1952, and whose prayer in honour of the Five Wounds, beloved of many a Passionist missioner, can be found here. In the present Passionist Calendar, the feast of the Five Glorious Wounds is now kept on the Friday after the Easter Octave. The Wounds of Christ are celebrated in the light of the resurrection, with the Gospel account of Jesus showing the wounds of his hands, feet and side to Thomas: Doubt no longer, but believe. I have been in Paris for the last few days, at our community of Saint Joseph's, avenue Hoche, where I previously spent seven happy years. I came here for a meeting on Passionist Spirituality and Charism, which concluded today. This evening, I took advantage of my visit to go to Vespers and Mass at the Church of Saint Gervais, behind the Hotel de Ville. Saint Gervais is the home of the Monastic Fraternity of Jerusalem, founded here in the 1970s by Father Pierre-Marie Delfieux. His inspiration in founding the community was to bring the monastic life of the desert into the new desert which is the modern city. In the Rule of Life he wrote for the community, he says: In the desert of the urban world your monastery should be an oasis of peace, prayer and joy. It is still amazing to see a large number of people coming here each evening, after their day's work, to spend between one and two hours praying with the community before returning home. Vespers began at 6.00, after a half hour of silent meditation before the altar. As usual the liturgy was sung beautifully in French, with much of the music being by Andre Gouzes o.p. The pause at the end of each psalm verse was an invitation to prayer and to an awareness of the One in whose presence the prayer was being offered. The Mass, which followed the Office immediately, was celebrated with dignity and simplicity. Times for reflection during the Liturgy of the Word, a thoughtful homily, moments of silence around communion time, and the possibility of remaining on for a period of thanksgiving after the Mass made this a way of celebrating Mass which seemed naturally to favour contemplation. This community of monks and nuns has grown significantly over the last thirty or so years. Like most of the new religious orders, they provide ways for people who are not called to professed life but who feel drawn to the community to belong in a meaningful way. One way of doing this is through the Gospel Fraternities of Jerusalem which allow laypeople the chance to be formed in the spirituality of the community. The Monastic Fraternity of Jerusalem now has eleven houses, including a new foundation in Montreal. For more background information on the community in English, see this article from Zenit's archive (scroll down to the section on the Monastic Fraternities of Jerusalem). This photograph and the one which follows are from Zadok the Roman's two fine posts on the Church of Santa Maria in Domnica and its new titular, Cardinal Levada, who took possession of his church yesterday. 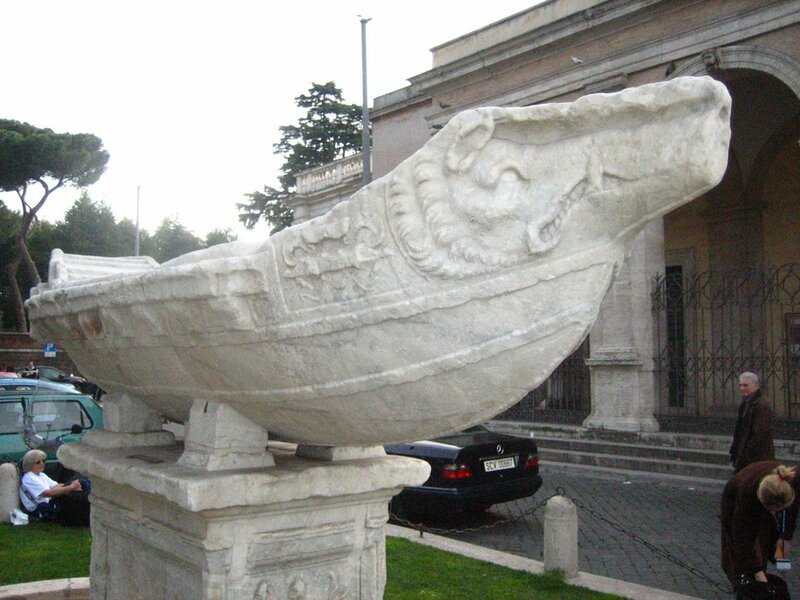 Known to the locals as "la Navicella", because of the fountain in the middle of the road outside the church, it is the parish church of the Passionist generalate at Saints John and Paul. Most Sundays, one of the Passionists walks along the Via San Paolo della Croce to the Navicella to assist the pastor by celebrating one of the Sunday Masses. When I lived in Rome, during the Easter season a number of people from our community would be engaged in going round the streets of the Navicella parish blessing families and their homes on behalf of the pastor. I often walked past the church in the mornings going to celebrate Mass for the English-speaking sisters of the Little Company of Mary at Calvary Hospital on the other side of the road. One of Cardinal Levada's "titolare neighbours" at Saints John and Paul is his fellow American, Cardinal Egan of New York. His neighbour on the other side is Cardinal Wetter of Munich at San Stefano Rotondo. Santa Maria in Domnica is significant for Passionists for another reason. It was here that Saint Paul of the Cross and his brother (and first companion), Venerable John Baptist Danei, asked the pope for permission to gather companions and form a community which would contemplate and proclaim the mystery of the Passion of Jesus. Pope Benedict XIII, a Dominican, was on his way to inspect restoration work which had been undertaken by an earlier titolare, Cardinal Corradini. The Cardinal, who had met Paul and John Baptist through a mutual friend, Monsignor (later Cardinal) Marcello Crescenzi, had told the two brothers to wait in the entrance for the Pope to arrive. The encounter, which is commemorated by a Latin inscription inside the church, took place just at the spot where Zadok has photographed Cardinal Levada. Paul and John Baptist fell to their knees and asked the Pope for permission to found what would later be called the Passionists. 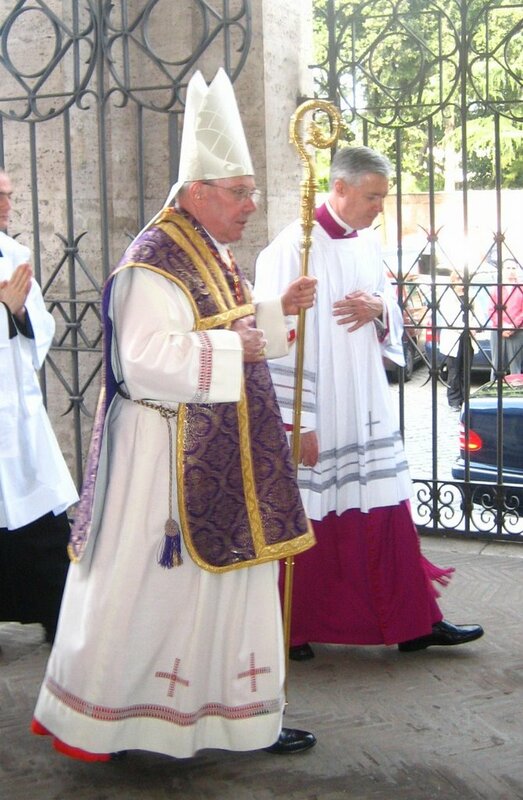 Pope Benedict gave his consent vivae vocis oraculo, and proceeded on into the church. They would meet again two years later, in 1727, when Benedict ordained the two brothers to the priesthood. It was sixteen years after the encounter at the Navicella before the next Pope Benedict, within months of his election, gave a written approval to the Rule of Saint Paul of the Cross in 1741, but Paul always looked on this brief conversation as being the first approval given to his community by the Church. This morning at 10.00, Thomas Davie opened the doors of the new Saint Mungo’s Bookshop, located beside the Church in Parson Street, Glasgow. It was a busier morning than we had expected when we chose the date; there was a surprise visit from Archbishop Mario Conti who was at Saint Mungo’s for a Lenten Service with about eight hundred primary school children. It has taken more than a year to have everything in place (although Thomas asures me that not everything is yet as it should be), but it was well worth waiting for. As well as a good stock of religious books and art, he will carry Passionist books and devotional items. So for material on the Passion of Christ, Saint Paul of the Cross, Saint Gemma Galgani, etc., contact Thomas. His postal address is Saint Mungo’s Retreat, 52 Parson Street, Glasgow G4 0RX; he has kept the same ‘phone number he had in the High Street (0141 552 5523). -Photographs of the shop to follow, I hope! The webmaster at Saint Peter’s Parish Greenville has put three of my sermons from last week’s retreat on the parish website. If you have realplayer, you can hear them here. The first is on living in the awareness of our nothingness, the second is on prayer, and the third is on the Eucharist.